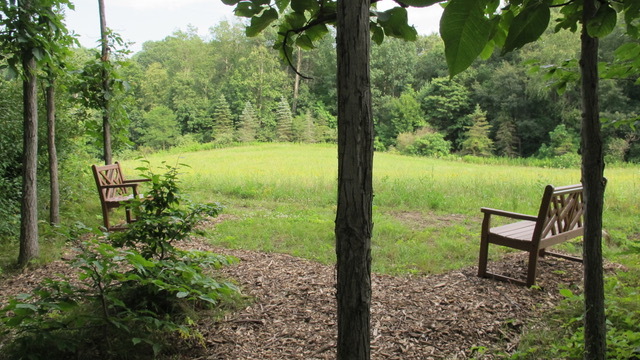 While walking the trails at The Hermitage, you may come across two seating areas, each with a bench and a single chair, nestled into the edge of the woodland overlooking a short-grass Prairie. The grasses, sedges and abundant wildflowers in the Prairie provide a home to butterflies and other insects, birds, and small mammals. Deer and other larger animals find forage and prey in this verdant place. The first Prayer Garden is dedicated to the memory of Gertrude Bailey Ruder, whose life of prayer and careful concern for living things we honor by this placement of a bench and chair, plantings of bulbs, flowering shrubs and the gathering of nut trees in this natural clearing on the edge of what was once the middle of a wooded area. 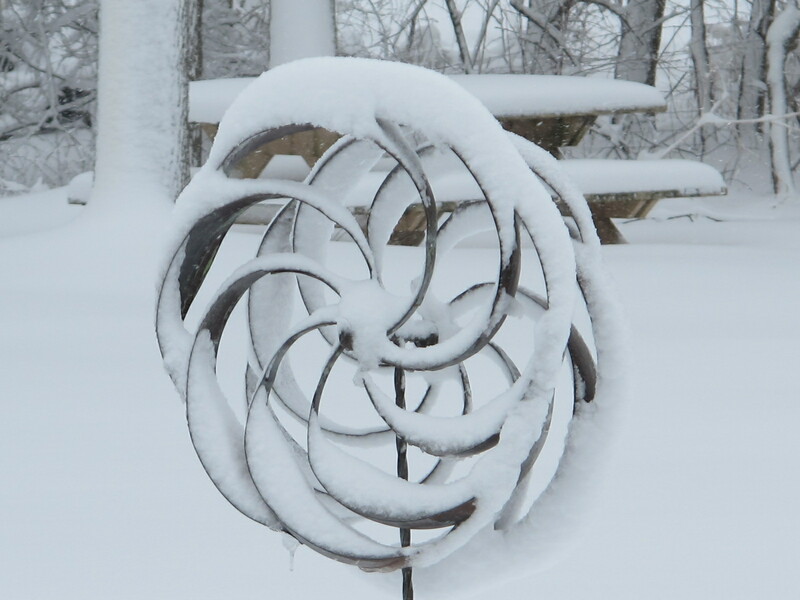 The second garden sits on a hill overlooking the trails and much of the wildlife that has come to call this prairie home. This area also has a bench and a single chair situated under the shading branches of a white oak that will hopefully become the dominant tree on this forest edge. What you cannot see under the Prairie are three fossil fuel pipelines. The first, was initially constructed in 1968. This pipeline was retired in 2014 after a massive rupture in 2010 dumping over 800,000 barrels of crude oil into the tributaries of the Kalamazoo River. The second pipe, carrying natural gas, was installed in 1999. The gas runs at a rapid rate through this 4-foot diameter pipe. Friction inside the pipe heats the surrounding soil so that the snow melts first here each winter often leaving a stripe of bare land. The third pipe is actually a “replacement” for the first pipe. The new pipe, is two times the size of the first pipeline, carrying millions of gallons of the Athabasca oil sand’s diluted bitumen (dilbit) to the refineries. As part of our “protest” against both our own way of life and the oil company’s placement of a poison stream under the earth’s surface we planted the Prairie. We also created the two prayer gardens flanking the Prairie. Most of all, come. We’d love to see you. Your presence is valuable to us. Don’t let the cost of the workshop be a hindrance to you. Consider making a donation toward the cost of building the structure and Thomas’ time. Let us know if you will be here for a meal: lunches at 12:30 and suppers at 5:30. Meal reservations should be made before Wednesday, May 30. We still have a few rooms available for overnight stay. Contact us to reserve a room or bring your tent and camp with Jay. Every person in the world is so put together that by praising, revering, and living according to the will of God our Lord, he or she can safely reach the Reign of God. This is the original purpose of each human life. This statement frames the Spiritual Exercises of Ignatius of Loyola. Ignatius’ life-long project, to introduce people to a method of following Jesus that engaged them in looking for God in all things, resulted in what we know as the Spiritual Exercises. While his original design was for a person to complete the exercises in 30 days, he recognized that many people would not be able to leave their work and families for that extended time. So, he also encouraged an adaptation of the exercises that spans approximately 30 weeks rather than 30 days. We are forming a small cohort of folks (limit 6) who wish to embark on the Exercises together using this expanded format. Participation will involve monthly meetings (2.5 hours) with the group and a monthly one-on-one meeting (1 hour) with Naomi Wenger, the Director of the retreat. Persons who want to participate should be able to commit to an hour of prayer and meditation each day for the duration of the retreat and to attend the group and private meetings. Cost for the retreat is $600. A deposit of $120 is due (by July 31) to reserve your place in the group. The initial meeting will be September 30 beginning at 9 am. Subsequent meetings will be scheduled at that time. If you are interested in being part of this group, please contact Naomi Wenger (Naomi@hermitagecommunity.org or 269-244-8696) by July 30.
supper. The work day will begin at 9 am with Morning Prayer in the Grove. The Feast of the Transfiguration retreat on Saturday, August 5, from 9 am to 4 pm, will be led by David and Naomi Wenger on the theme, “Until the day dawns,” exploring the possibility of spying God in the everyday. We will have time for prayer, walking, quiet, and communion around the Lord’s Table. There will also be a covenanting ritual for those choosing to be part of The Hermitage Way, for the coming year. Join us for this retreat, counting our extra- ordinary, daily blessings. 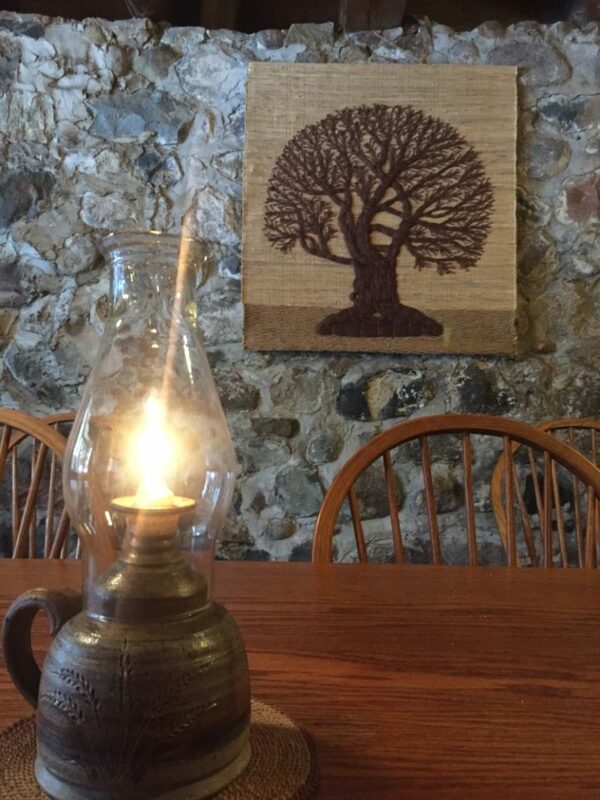 A midday meal will be provided for retreat guests on Saturday. There is no cost to participants of the workday or the retreat. Donations are accepted for overnight stays before or after either day. 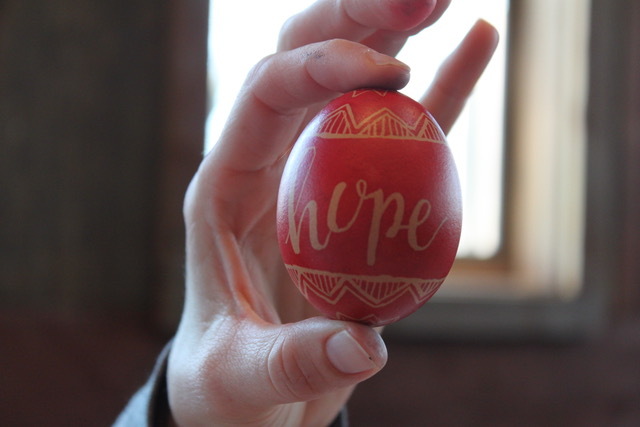 Let us know you are coming or reserve a room: call (269-244-8696) or email (contact@hermitagecommunity.org) to let us know your intention. 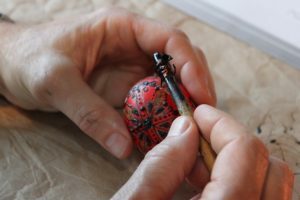 A handful of people came together in Gathering Room on April 15, Holy Saturday, to create pysanky eggs, in the ancient Ukranian tradition of decorating Easter eggs. The day began with the reading of Chicken Sunday, a children’s storybook written and illustrated by Patricia Polacco. In the story three neighborhood friends decorate and sell pysanky eggs to earn money so that they can buy an Easter hat for a beloved grandma. Next, David gave instructions on the process of decorating eggs using a kitska, a writing tool which dispenses warmed bees wax onto the egg. Then eggs were dyed starting with the lightest color dye, adding wax after each dying, and ending with the darkest dye. Participants chose their designs from the many examples available or created their own. 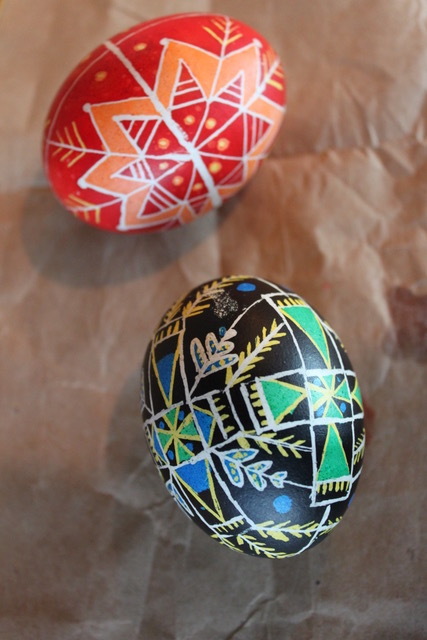 We all worked at our own pace; some decorating several eggs throughout the morning and afternoon. The most exciting part of the process happens when the design is complete and the final dye is dry. 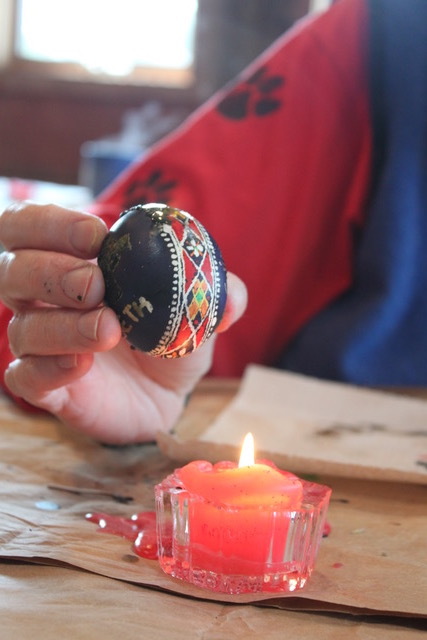 The wax on the egg is slowly melted and wiped off revealing the glorious pattern of colors that have been preserved by the wax relief process. The eggs used for decorating had all been blown out so we ate a hearty egg casserole for lunch. We hope to offer this event again next year. Look for an announcement on the Hermitage calendar sometime in February. We wish you an Advent full of anticipation, waiting full of hope and, consolation that does not disappoint. Please consider this letter from our board President. “The space will teach you,” David and Naomi said to Kristi and I at the beginning of our sojourn at the Hermitage. Our first two weeks were spent absorbing all of the information we could from them before they departed on sabbatical. We felt confident enough to proceed, especially with the help of so many supportive volunteers. But then the septic tank overflowed, the phone line went bad, and the washing machine died to name just a few of the unanticipated maintenance mishaps during the Wengers’ absence. We, alongside our beloved volunteers, often worked too much. Even our morning gathering for prayer in the Chapel of the Transfiguration became for us at times a contemplative chore. What was the space teaching us? 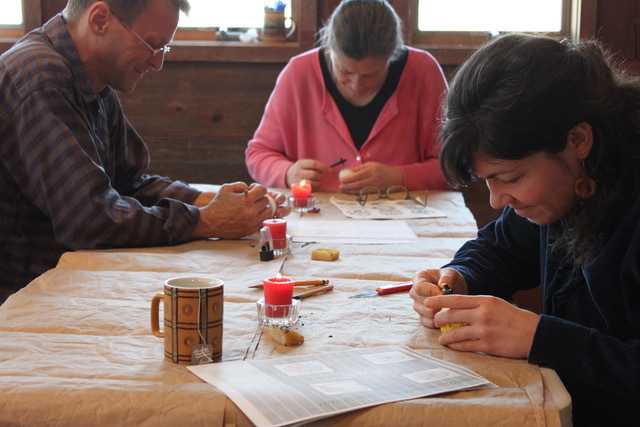 In the middle of August a group from Western Theological Seminary held a 10-day “Hebrew Camp” at the Hermitage. They spent much of their time in the chapel learning and dramatizing the story of the healing of Naaman in the original Hebrew. In their final performance they began by singing a beautiful Hebrew blessing for the reading of scripture. Part of the blessing describes the encounter with scripture as “steeping in the Word.” This phrase caught my attention and has remained with me. What does it look like for us to steep in the same peace that retreatants find when they come to this place? And so we went. 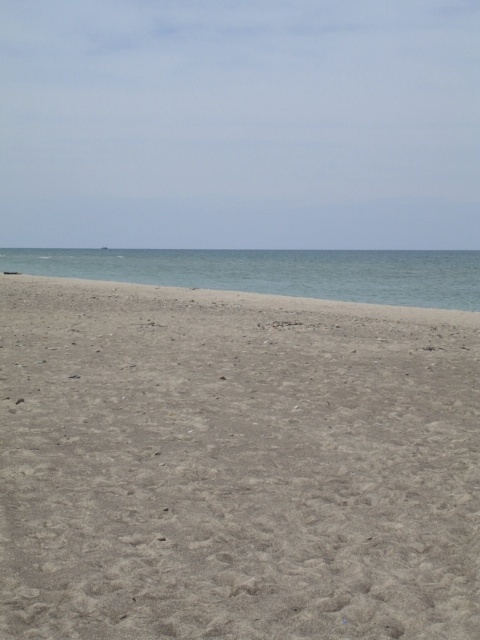 We swam in the cool waters of Lake Michigan and laid on the beach for the better part of an afternoon listening to the little waves breaking upon the sand. On this threshold the stones are ground down until they shimmer and are soft underfoot. We are made small enough to be soft underfoot and to glimmer with the grandeur of God. 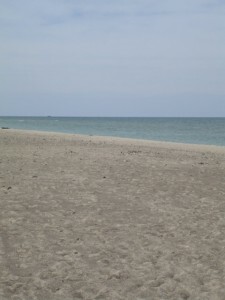 At the end of the day we returned home with sand between our toes, the feeling of breathing deeply and fully, and a trunk filled with Michigan apples. Prior to our engagement and into the first several months of marriage Kristi and I saw a wonderful marriage and family therapist. When asked how she was able to transition so quickly from the concerns of one client to the next and be present to all, she explained that she always pauses at the threshold and touches the door frame on the way in and out of each room as a ritual to set apart. Remembering her practice, I pause daily now at the threshold of the chapel and touch the door frame, as one might brood over a mug of hot tea–bringing the rim close, inhaling the steam and then sipping. The maple outside our front door drops her flaming leaves, storing up for another Michigan winter. And so as I walk past the carpet of color, as we work, as we rest, I also am letting go and storing up for this new season. I pause, soak and steep, leaving openings in my day to be taught again.